If you needed to actually count the number of browser tabs you have open right now, you have too many open. First of all, you’re probably pushing your computer’s limits. How many times have you had to restart your browser because of one error or another? (Don’t actually count — it’ll take too long). Second of all, you’re crippling your productivity. Not only do you lose time whenever your browser decides to stop working, but you also lose precious minutes every time you get distracted by an errant tab. If, for whatever reason, you find yourself being stretched too thin by a barrage of browser tabs, we’re here to help. Read on for some helpful tools you can use to clean up your tab-stuffed browser, as well as practical tips to help boost your web browsing productivity. Luckily, there are many tools available for your browser that will help you maximize your productivity. Found a bunch of sources for a research project — or just some cool stuff — but don’t have time to read it all right now? 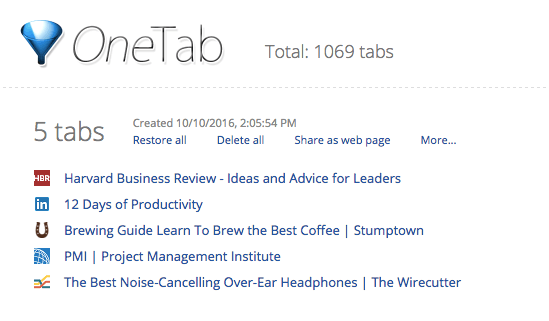 With a single mouse click, OneTab will condense all of your tabs into a single list for you. When you’re ready to dive back in, simply click the OneTab button on your browser to be brought back to the list of resources you curated earlier. Just don’t open them back up again all at once. You’re trying to reduce the amount of browser tabs you keep open, remember? Tab Wrangler and AutoClose Tabs for Firefox automate the process of ensuring your browser tab count stays low. These plugins close tabs you haven’t clicked on after a designated period of time. This will keep you from ending up with 25 tabs open when you’re only really using two or three of them. If you need to keep a tab open but don’t have the time to check it out immediately, you can pin it down to ensure it doesn’t accidentally get closed out. Tabs that have been closed are also easily retrievable, so it’s not like a closed tab is lost forever. One of the reasons we keep so many tabs open is because organizing bookmarks is a pain. Start.me is a personalized start page that allows you to easily save and organize webpages for later viewing. You can set up separate start pages for different topics or create different folders on a single page for easy viewing. To add a page to your dashboard, simply click the start.me button on your browser and select the folder you want to save it in. Your saved pages are displayed right on your dashboard. With start.me, you won’t end up wasting time wading through a sea of disorganized bookmarks looking for the one that you actually need. And you’ll probably cut down on the amount of tabs you keep open at the same time, too. You pride yourself on being a multitasker. It’s one of the qualities that got you where you are today, right? I hate to tell you this, but your habit of multitasking might actually be what’s holding you back. We humans perform best when we concentrate on one task at a time. Doing so allows us to enter a flow state. This is when everything around you fades away and you’re able to focus on the task at hand. With so many browser tabs open, you stand little chance of being able to enter this flow state. And even if you do manage to block out the other tabs you have open for a moment, it doesn’t take much to break your concentration. Once this happens, it’ll be another 15 to 25 minutes before you’ll be able to regain the focus and precision you had just built up. Keep your tab count low, and watch your web productivity skyrocket. Those tools mentioned earlier will only get you so far. If you really want to become master of your browsing domain, you’re going to have to work at it. The challenge is to choose the approach that works best for you. You might choose to visualize your open tabs as physical objects cramping your workspace. Think of dirty dishes: one empty coffee cup might not be too much of a nuisance, but a pile of grimy plates is enough to drive you nuts. If you don’t do anything about the pile, it becomes easier and easier to let it get out of control. The same goes for a collection of stale browser tabs. Try to keep your tab count under control from the moment you open your browser. Otherwise, it becomes much too easy to lose track of the amount of tabs you have open. You know how much you can handle without losing your mind. Set a limit for the amount of tabs you’ll allow yourself to have open at one time, and stick to it. By setting this limit, you ensure you’ll only click on links you really want to check out – and you’ll also ensure you actually read them all, too. Setting and sticking to limits also forces you to stay on task whenever you open your browser. Without such limits in place, it’s much too easy to get distracted and end up spending way too much time checking out sites that have nothing to do with the task you set out to accomplish. Experiment with the tools and techniques mentioned earlier whenever you browse the web. Keep what works, and toss what doesn’t. If you really want to sharpen your browser-tab reduction skills, consider trying one of these bonus strategies. They sound simple, but each one can make a substantial difference. And if you try all three together, your browser may not even recognize you! Maintain different browsing habits for different purposes. If you’re browsing leisurely, there’s nothing wrong with letting your mind wander a bit. But if you’re working under a deadline and need to stay focused, try to keep your tab count as low as possible. This isn’t an exact science. Stick to the methods that work best for you, and don’t force anything if you know it’s not going to make you more productive — but if you like the sound of a method, stick with it long enough to really see the results. Keeping your browser tab count low seems like a lot of work — and it is. In truth, though, keeping more tabs open than you need creates much more work for you in the long run. And it makes it much more difficult to actually get your work done in the first place. Prioritizing your browser tabs gives you total control over your browsing habits — and your web productivity as a whole. With these tools, strategies, and tips, you can keep your browser tab count lean and mean — and dial up your productivity in the process! Matt is a blogger and copywriter who looks for the deeper meaning in all things. A chronic over-analyzer, Matt channels his energy into reading and writing as much as he can and exploring unique ways of seeing the world along the way. Get in touch with him on Twitter.